Our tour will start with an overview of Jerusalem from Mount of Olives, looking down at the Old City and the Temple Mount. We will then go to see the Church of All Nations in the Garden of Gethsemane and view the monumental burial tombs, while driving along the Kidron Valley. We will enter the Old City from Mount Zion, past the Armenian Quarter and continue along the Byzantine Cardo through the Jewish Quarter to the Western Wall (the Kotel). Continue by walking through the Stations of the Cross (Via Dolorosa) to the Church of the Holy Sepulture. 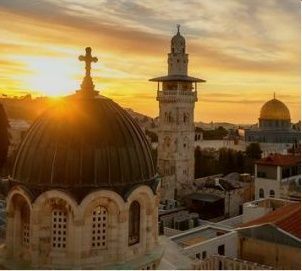 Walk through the bazaar in the Christian and Muslim Quarters and end with a short tour of the New City and a visit to Yad VaShem, the Holocaust museum. Note: On Saturdays, when the Holocaust Museum is closed, the tour will include a visit to David's Tomb and the Room of the Last Supper on Mount Zion. Modest dress-code: covered shoulders/NO shorts. Change of vehicles is required for transfers of pick-up/drop-off destinations to save time, and to avoid traffic and delay.